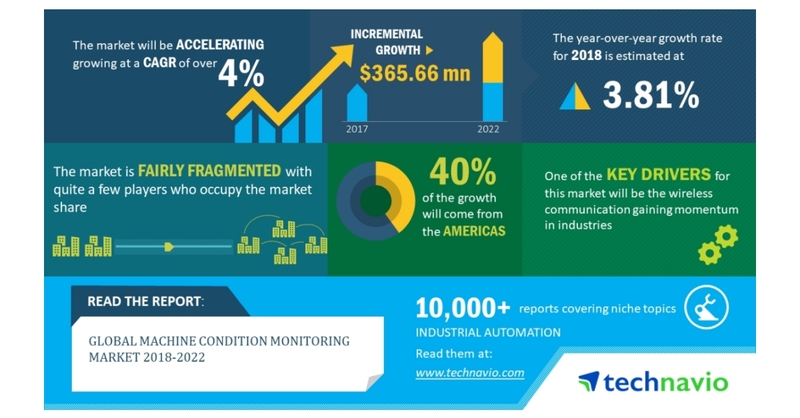 LONDON–(BUSINESS WIRE)–According to the latest market research report released by Technavio, the global machine condition monitoring market is expected to accelerate at a CAGR of over 4% during the forecast period. Wireless communication gaining momentum in industries is one of the key factors triggering the growth of the market. This research report titled ‘Global Machine Condition Monitoring Market 2018-2022’ provides an in-depth analysis of the market in terms of revenue and emerging market trends. It also includes an up-to-date analysis and forecasts for various market segments and all geographical regions. In 2017, the Americas accounted for 36.30% of the global market and is projected to reach 36.91% by 2022, exhibiting almost a 0.61% increase in market share. The EMEA region will register a decline in the market share with a decrement of 1.04%. Numerous end-user industries are adopting machine condition monitoring systems that can be integrated into their existing Information Technology (IT) infrastructure. This integration confirms that the test operating conditions are met and enhances the overall accuracy of the systems. The emergence of integrated machine condition monitoring system or condition monitoring equipment has been identified as one of the key trends, which will gain traction in the machine condition monitoring market during the forecast period.